500 Days Of Film Reviews Documentary, Won’t You Be My Neighbor? An intimate portrait of Fred Rogers, Won’t You Be My Neighbor? takes us beyond the zip-up cardigans and the land of make-believe and into the heart of a creative genius who inspired generations of children with compassion and limitless imagination. Growing up in the UK, I started watching Won’t You Be My Neighbor knowing more about director Morgan Neville (his Oscar winning documentary, 20 Feet From Stardom, is superb) than I did about Fred Rogers. As a result, I felt slightly removed from the poignant nostalgia encouraged by the first part of this documentary. I saw in Fred Rogers a genuinely kind and generous man on a heart-warming mission to produce compassionate television shows for children. I appreciated that this is a fascinating life story. However, as much as I liked and enjoyed Neville’s film, I couldn’t understand why Won’t You Be My Neighbor? had received such rave reviews - from critics and audiences alike - and scooped up a number of prestigious awards. And then, in a clip from Rogers’s long running show, a small, slightly scruffy cat puppet called Daniel asked what the word assassination meant. From that moment on I was hooked - completely and emotionally hooked. The inspiration for this question was the assassination of Robert Kennedy. Rather than ignoring children and their awareness of such shocking events and issues (including, in another powerful clip, racism), Fred Rogers decided to tackle them head on - helping children to cope and offering them friendship and comfort. While other shows spent their time tipping brightly coloured gunk on people’s heads or encouraging young audiences to laugh at the mistakes (and minor accidents) of others, Rogers showed how children’s television could, instead, be thoughtful and caring - gently guiding kids through the tricky business of growing up in a far from perfect world. The more I understood Rogers’s approach to children’s television - from the film’s archive footage, clips from the show and interviews with his family, friends and colleagues - the more I found myself invested in the philosophy of Fred Rogers (and the more I understood the shock when the documentary was not nominated for an Academy Award). I did not grow up watching Fred Rogers. Nonetheless, I found Neville’s powerful documentary about his life to be a profoundly moving experience and a timely reminder of the power of love, kindness and compassion. 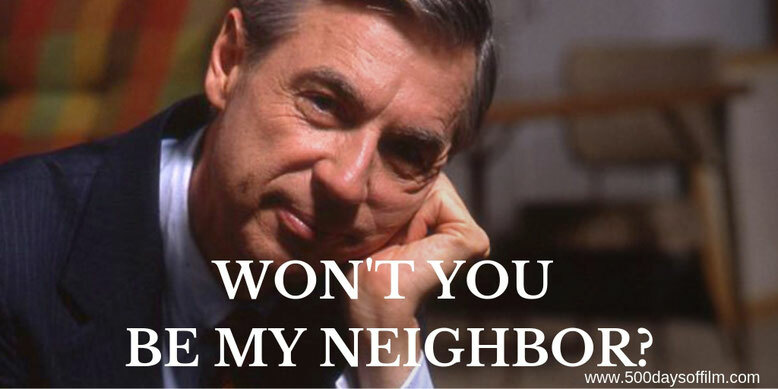 Have you seen Won’t You Be My Neighbor? If you have, what did you think of Morgan Neville’s film? Let me know in the comments section below or over on Twitter. You can find me @500DaysOfFilm.